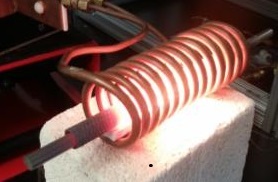 THE LAB determined that an EASYHEAT 6 kW induction heating system with a multiple-turn helical coil sized for the silicon carbide tube would be optimal for their application. Ambrell's applications engineers found that the part could heat to temperature within 90 seconds with this system, meeting the client's objectives. The solution included pyrometers and a controller, enabling a closed-loop solution. Induction's rapid, repeatable heating was of particular value to the client as was the precise heating which is optimal for zone heating. The versatility of Ambrell's EASYHEAT induction heating system along with its modest size were also factors. And, finally, the capability of THE LAB to prove their application's viability before making a purchase set Ambrell apart. Free testing is available from THE LAB. So if you'd like to see if your process can benefit from induction heating by Ambrell, the engineers from Ambrell would be happy to help you. To read about other applications tested by THE LAB at Ambrell, visit our applications page.